Adaptation practice is a novel and dynamic field. This is reflected by an as yet limited experience in how climate change uncertainties can be best dealt with in particular situations. This chapter synthesises the theoretical (scientific) and practical aspects of the preceding chapters, draws key lessons and provides guidance for those involved in supporting and ultimately making adaptation decisions. For this purpose a Common Frame of Reference (i.e. 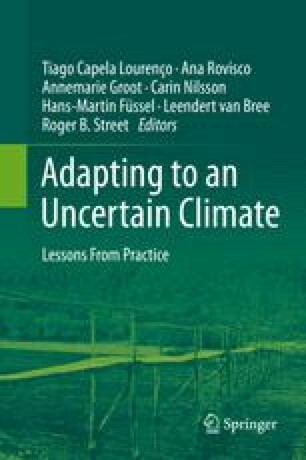 common definitions, principles and understandings) for dealing with uncertainties in climate adaptation decision-making is presented and applied to the analysis of the twelve real-life cases presented in this book. This framework intends to support complex climate adaptation decision-making processes that have to deal with uncertainties and still make informed decisions. Two central questions were addressed and applied to the cases reported: (i) how did the approaches used to deal with climate uncertainty influence the adaptation decision-making process and (ii) have better informed adaptation decisions been made because uncertainties were conscientiously addressed? The objective of this chapter is not to provide a simple checklist to be followed when facing uncertainties in a climate adaptation process but rather to inform and guide the reader by presenting key lessons and insights from real-life cases where decision-makers and those that support them have already faced and responded to climate adaptation related uncertainty. Lemos, Maria Carmen, and Richard B. Rood. 2010. Climate projections and their impact on policy and practice. Wiley Interdisciplinary Reviews: Climate Change 1(5):670–682. doi: 10.1002/wcc.71. Lempert, Robert J., and David G. Groves. 2010. Identifying and evaluating robust adaptive policy responses to climate change for water management agencies in the American West. Technological Forecasting and Social Change 77(6):960–974. doi: 10.1016/j.techfore.2010.04.007. Lynch, Amanda H., Lee Tryhorn, and Rebecca Abramson. 2008. Working at the boundary: facilitating interdisciplinarity in climate change adaptation research. Bulletin of the American Meteorological Society 89(2):169–179. doi: 10.1175/BAMS-89-2-169. Tompkins, Emma L., W. Neil Adger, Emily Boyd, Sophie Nicholson-Cole, Keith Weatherhead, and Nigel Arnell. 2010. Observed adaptation to climate change: UK evidence of transition to a well-adapting society. Global Environmental Change 20(4):627–635. doi: 10.1016/j.gloenvcha.2010.05.001. Tribbia, John, and Susanne C. Moser. 2008. More than information: What coastal managers need to plan for climate change. Environmental Science and Policy 11(4):315–328. doi: 10.1016/j.envsci.2008.01.003.